Tablet für alle? Ob man lieber tippt oder mit der Hand schreibt, oder dem Touchscreen navigiert, das HP macht bei allem mit. Zudem verspricht HP Leistung auf Notebookniveau und bis zu acht Stunden Akkulaufzeit. Ob der 12-Zöller unseren Erwartungen nachkommt, wird im Folgenden ausführlich beschrieben. Wer beim Mobilcomputer Wert auf eine volle Notebook-Ausstattung, Handschrifterkennung und präzises Zeichnen legt, kommt an den Windows-Tablet-PCs weiterhin nicht vorbei. Richtig Spaß machen die Geräte aber nur mit dem Stift in der Hand, denn Windows fehlt es weiterhin an einer konsequent auf Fingerbedienung ausgerichteten Bedienoberfläche, und die Zusatzangebote der Tablet-Hersteller sind ungenügend. Consumer-Tablet: Das HP Touchsmart tm2 eignet sich auch für Spiele und Multimedia und bringt Spezialsoftware für Touchbedienung mit. Metallgehäuse, Touchpad in Grafit-Optik, sogar die Zeichen auf der Tastatur, alles am HP TouchSmart tm2-1090eg wurde durchdesignt. Ob einem das Gehäuse und das Wellendesign gefällt, ist wie so oft Geschmackssache, wertig wirkt das Gehäuse auf alle Fälle. Dazu kommen ordentliche Eingabegeräte, wenn auch die Idee, die Touchpadtasten in die berührungsempfindliche Fläche des Touchpads zu integrieren uns aus praktischen Gesichtspunkten nicht gefällt. Das Touchsmart tm2 gefällt durch gemusterte Alu-Oberflächen kombiniert mit schwarzen Kunststoff und punktet in Bezug auf Stabilität und Verarbeitung. Durch eine leichte Keilform wird eine ergonomische Haltung beim Tippen erleichert. Im hochformatigen Tablet-Modus kann diese Neigung aber nicht überzeugen. Eingaben kann man nicht nur mit Tastatur und Touchpad tätigen: Das tm2 bietet darüber hinaus auch noch einen Touchscreen. A tablet PC is always a compromise – it obviously has to work well as a touch-screen device, but since a fair share of users will use it as a "regular laptop" more often than as a tablet, it has to offer good usability on that side too. 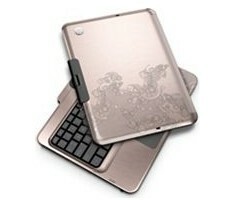 HP has done well with the TouchSmart TM2 tablet. It's a good compromise between usability and exceptional battery life, even if its performance could have been better. 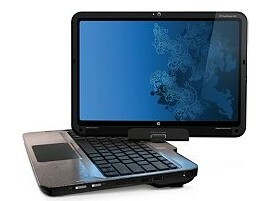 Even if the iPad didn’t exist, we wouldn’t recommend the HP TouchSmart tm2. 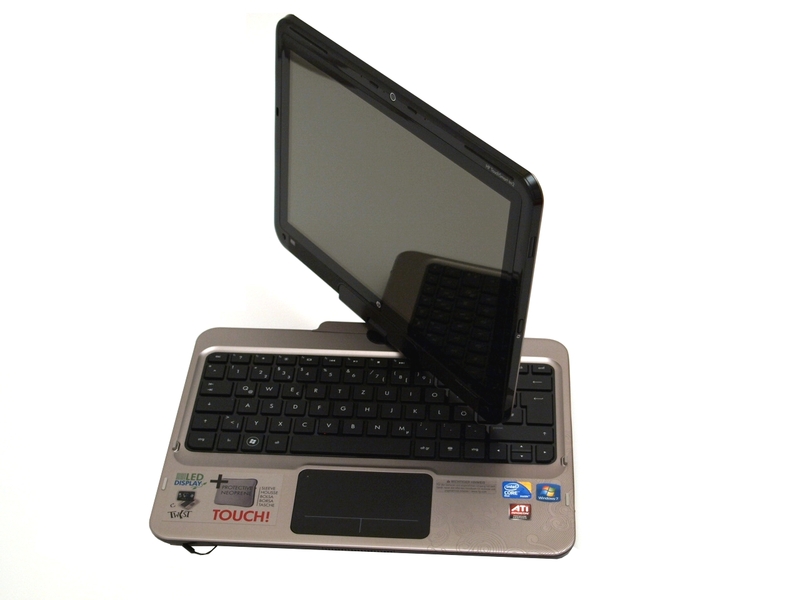 Its touchpad is one of the worst we’ve used. But the fact that Apple’s slate is now available to the masses makes this convertible an even tougher sell. 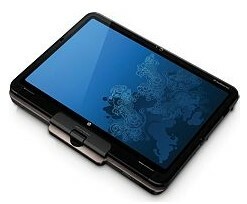 Consumers who know better will no longer tolerate a tablet that doesn’t change screen orientation automatically based on how you’re holding the device, and they’ll scratch their heads wondering why it takes so long for TouchSmart’s apps to load when there’s a Core i3 processor under the hood. And although we give HP credit for trying to build on top of Windows 7, the OS simply can’t compete with the iPad when it comes to touch-enabled apps. We still like the idea of a tablet with a full-size keyboard--and see the merit of stylus-based input for some--but this product disappoints. Thanks to the Apple iPad, tablet computers are a concept recently discovered by countless consumers, but a contingent of die-hard road warriors and business-laptop users have been using them for years. Unlike most ultraportable convertible tablets, the tm2t includes switchable graphics, features strong battery life, and doesn't cost too much. 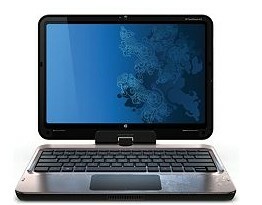 The HP TouchSmart tm2t has a lot to offer and is solidly built. 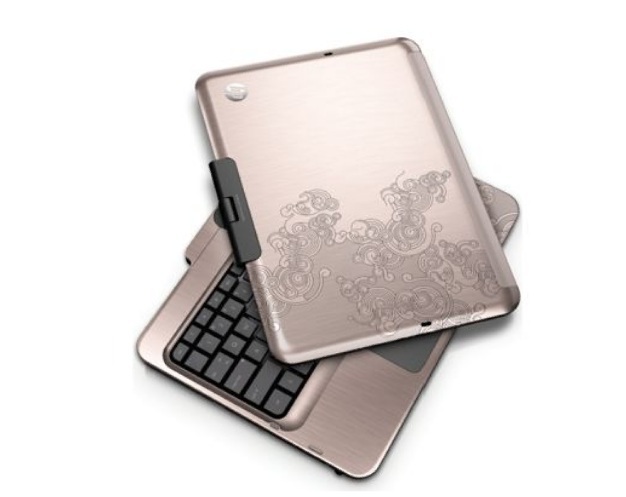 It is a great student laptop in many ways: it offers an easy way to take class notes via the pen input, battery life is very good, the design is attractive and the aluminum construction makes it durable yet not too heavy to be portable. The main drawbacks to the tm2t is that it uses a low voltage processor, so it’s not the fastest PC out there, and some of the software drivers such as the touchpad and touchscreen are buggy and could do with some tweaking out of the box. With the recent surge in the popularity of tablets thanks to the Apple iPad, you would expect the variety of tablet-laptops to have increased as well. Unfortunately, this is not yet the case. Here in the UK at least, the only easily available, sub-£1,000 options for a convertible tablet are the Packard Bell Butterfly Touch and Acer Aspire 1825 – and of course HP's TouchSmart tm2, which we're looking at today. 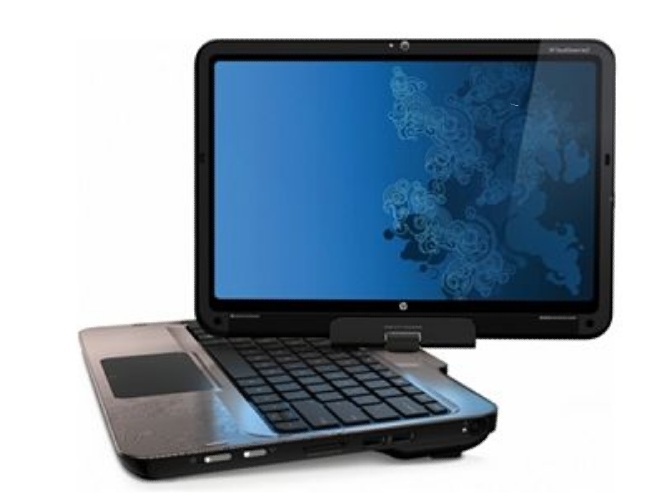 The HP TouchSmart tm2-1010ea tries to be both a tablet and laptop, but it ends up falling between two stools. Unless you're dead set on owning a swivelling, convertible machine, we'd recommend you opt for a more powerful laptop, such as the cheap, 17.3-inch Samsung R730, which will better serve your media needs. On the other hand, if you're sure you want a tablet, the tm2-1010ea probably isn't what you're looking for, because it's fairly heavy and the touchscreen interface is slightly too clunky. 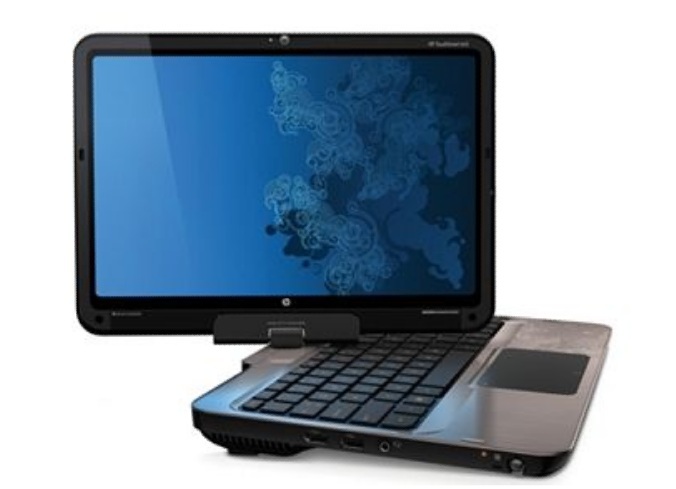 With a strong range of touch software installed as standard, the HP TouchSmart tm2-1010ea has a sharp and well supported touchscreen display. Its solid build, incredible portability and impressive features round off this strong contender, making it a worthy award winner. Yes I know it’s been a long time since I have reviewed any HP PC’s but once a company changes agencies it often takes a long time to get involved again. It is a little ‘curates egg’ like and I think you would definitely want to try it before you buy as the back heavy nature of the unit could be a problem for some, it has to back heavy to accommodate the twist screen action of it. The final drawback is the price. Unfortunately, at this price the HP TouchSmart TM2 is too slow to be a decent laptop, and way too heavy and clumsy to be desirable as a tablet. 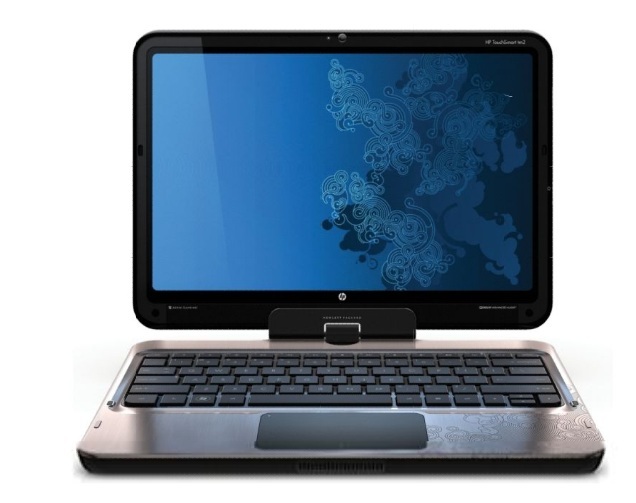 With a price of roughly $900, the HP TouchSmart tm2-2050us is a very affordable option for those looking at an ultraportable laptop that can also double as a tablet PC. Performance is solid thanks to the new Core i3 ultra-low voltage processor and it has a surprisingly larger hard drive. It isn't without its faults though including a touchscreen that is very glossy that can be difficult to see in certain light and a battery pack that adds a bit too much bulk. ATI Mobility Radeon HD 4550: Minimal höher getaktete HD 4530 und Vorgänger von der HD 5430.Intel Graphics Media Accelerator (GMA) 4500MHD: Im GM45, GS45 und GE45 Chipsatz (Montevina Plattform) integrierte shared Memory Grafikkarte von Intel. Durch höhere Taktung und mehr Shader ist sie deutlich schneller als die X3100, jedoch immer noch nicht für Spieler empfehlenswert. Kann HD-Videos (AVC/VC2/MPEG2) dekodieren und so die CPU entlasten.ATI Mobility Radeon HD 5450: Einsteiger Grafikchip mit DirectX11 Unterstützung. Etwas geringer als die HD 4570 getaktet und dank 40nm geringerer Stromverbrauch.Intel Graphics Media Accelerator (GMA) HD Graphics: Intel HD Graphics oder GMA HD genannte onboard Grafikkarte welche im Package der Core i3/i5/i7 Arrandale Dual-Core Prozessoren untergebracht wird. Je nach Prozessormodell maximal mit 500 bis 766 MHz getaktet (Turbo Boost). Von Lenovo anscheinend auch GMA5700MHD genannt. Die gleichgenannte Intel HD Graphics Prozessorgrafik in den Sandy Bridge Prozessoren basiert auf einer neueren Architektur.» Weitere Informationen gibt es in unserem Notebook-Grafikkartenvergleich und der Benchmarkliste. 330UM: Der Core i3-330UM ist ein sehr sparsamer Ultra Low Voltage Prozessor ohne Turbo Boost und AES Funktionen (Unterschied zu den i5 und i7 UM CPUs). Dank Hyperthreading werden bis zu 4 Threads gleichzeitig bearbeitet. Im Package ist auch noch eine integrierte Grafikkarte (GMA HD mit 133-500 MHz) und ein Speichercontroller für DDR3 800.380UM: Der Core i3-380UM ist ein sehr sparsamer Ultra Low Voltage Prozessor ohne Turbo Boost und AES Funktionen (Unterschied zu den i5 und i7 UM CPUs). Dank Hyperthreading werden bis zu 4 Threads gleichzeitig bearbeitet. Im Package ist auch noch eine integrierte Grafikkarte (GMA HD mit 133-500 MHz) und ein Speichercontroller für DDR3 800. 72%: Diese Bewertung ist schlecht. Die meisten Notebooks werden besser beurteilt. Als Kaufempfehlung darf man das nicht sehen. Auch wenn Verbalbewertungen in diesem Bereich gar nicht so schlecht klingen ("genügend" oder "befriedigend"), meist sind es Euphemismen, die eine Klassifikation als unterdurchschnittliches Notebook verschleiern.» Lesen Sie auch unsere Notebook-Kaufberatung.